I had thought I’d like Budapest, sure. It looked beautiful – domes, churches, the river – and who can argue with a city where it’s a part of the culture to soak in warm or cold water in ancient and ornate bath houses? From the moment I left Magda’s apartment for the first time, free of that god-awful pack (fine, fine I’ll admit it: I definitely brought too many clothes. Next time: less t-shirts, more underwear), I already felt excited. Her apartment is on the 2nd story, overlooking the inner courtyard of the building, where a Indian restaurant simmers delicious curries all day long below. The spiraling stairs had once been grand, now the tiles along the walls are fading, but taking the long sweeping turns, touching the intricate metal banister made me feel invigorated and alive. We walked into the cooling afternoon, towards the Danube, and turned left to see the grand St. Stephen’s Basilica, named after the first true king of Hungary – and the home of his holy right hand, mummified and encased in one of the back chapels. We climbed the winding stairs quickly, sweating and breathing heavily between banter; it’s hard to stop talking about you’ve not seen someone for six years. We reached the top of the central dome of the basilica and stepped out onto the balcony just as the wind was picking up, sending most of the other tourists indoors. From the east we could see a storm coming in, lightning beginning to dance along the horizon and rain fogging our view of the outer reaches of the city. 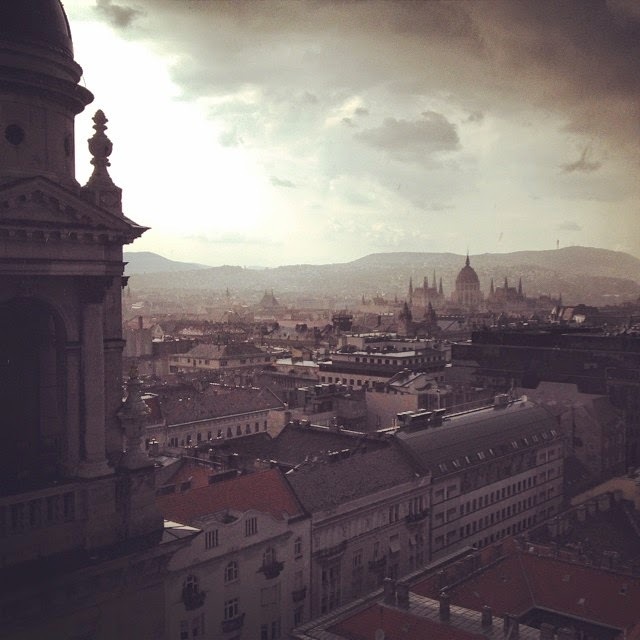 To the west we saw the Danube and Buda, the hills of houses and churches still glimmering in the sunlight. As the rain started whipping around the domes and spires of the basilica, Magda and I looked at one another and laughed, delighted, feeling the energy of the storm spraying and lashing around us. This introduction to the beautiful and vibrant Budapest woke my soul up quickly and set the tone for my fantastic three and a half days there. How Long: I arrived from Bratislava (2.5 hours away by bus) midday on Wednesday and left early Sunday morning, extending my trip by a day, when I was originally planning to leave on Saturday. I just felt so inspired and happy there, I couldn’t pull myself out quite that soon. What I did: As you can read about in this post, my friend Magda who I worked with in Yellowstone National Park six years ago just moved to Budapest to get her PhD. It was perfect because we were able to be tourists together! It was great to reconnect and discover the city together. I’m so jealous she gets to live here for the next 2-3 years! We began our time with the Free Walking Tour of the city, visiting all of the main sights along the Danube in both Pest and Buda (the official name of the city is a combination of the two neighborhoods on either side of the river). This was one of the most uphill walking tours I’ve done so far, as we climbed the entire hill up to the Royal Palaces and Fisherman’s Bastion in Buda. The views are well worth it up there, though. This tour group also offers walking tours of the Jewish Quarter and Communism Tours in the afternoons, taking you to other parts of the city and exposing more specific sides of the history here. With all local guides, I’m sure these both would be interesting options. We wandered the Jewish Quarter as well, reviling in the small tree-lined streets full of cafes, modern coffee shops and ruin pubs. The ruin pubs are a new phenomenon sparking up in Hungary: the empty, ruined remains of houses or businesses are turned into pubs, filled with a very alternative feeling, graffiti, locals and tourists. The Jewish Quarter (like most cities in this part of the continent) was once the Jewish slums, now turned into a posh residential neighborhood bearing very little of the namesake history besides a few synagogues. Budapest boasts the most spectacular synagogue in all of Europe – the second largest in use in the world, and there is a museum inside commemorating the local victims of the Holocaust. There are 6 Turkish and Hungarian bath houses in Budapest, and I chose to spend a day at Gellert, a Hungarian bath house featuring art deco rooms surrounded by statues, an outdoor wave pool and a hotel if you want to be real fancy. I wish I could have stayed longer and sampled a few more, but a word to the wise: bring a swimming cap if you have one so that you don’t have to rent one in the indoor baths! Budapest is full of museums and green space and places to wander, but I found myself feeling so inspired that I ended up working on my book most of my third day, setting up shop in a coffee and wine shop and drinking a lot of espresso. After Budapest I spent a few days southwest in the city of Pécs (pronounced paich – Hungarian is completely impenetrable to me), a very pleasant and historic town with a lot of vibrant young people. It was named a European Capital of Culture in 2010. With an interesting cultural quarter, featuring a plethora of museums and cafes, as well as and old town with the most beautiful cathedral I’ve ever seen and Roman and Turkish ruins, Pécs is certainly worth a trip. A note, however: I had hoped to travel from Pécs to Novi Sad or Belgrade in Serbia, but there was virtually no way to do this without changing busses or trains 5-7 times, and even in the Budapest train station some of the clerks did not speak English so I was not interested in playing a game of getting lost in that maze. This meant I needed to take the 3 hour train ride back to Budapest and then back track south 6 hours to Belgrade, spending a whole day on trains and busses. BLEH. Where I Stayed: Magda has a great apartment just a few blocks from St. Stephen’s Cathedral – probably a better location than any hostel, honestly, and with my own shower and laundry facilities! In Pécs I stayed at the Nap Hostel, a great location with incredibly helpful staff (we all suffered through trying to figure out the buses and trains into Serbia together) and directly over a nice bar where many young locals hang out every night. The first night I was there, a French band, featuring a chorus of male trombone, saxophone and trumpet players with a beautiful woman singing out front performed, bringing the whole town out and filling the street on what could have been an otherwise quiet Sunday night. What I Ate: Not much to report here. Hungarian wine is really good, and I enjoyed a few tastes of that, but I didn’t have much traditional food from the area. Magda and I cooked a lot of spaghetti and she made me some very good traditional Romanian dishes! Total Costs: Of course having a place to stay and a friend to cook food with brought down the costs pretty dramatically. As a capital city with so much history and beauty, the hostel prices seemed to be somewhere in between Prague and Vienna, with food and drinks being relatively cheap as long as you keep to the golden rule I’ve mentioned before: The Closer You Are to the Danube, The More the Food Will Cost. - Central Europe is tipping land unlike France and other European countries. If you are paying for your meal/drink and you hand the waiter cash and say “Thank you” you are telling him/her that you don’t want change, no matter how big that bill is. If you do want change from the bill, wait till they give the change back and then hand them the tip you want to give and say “Thank you” then. - When you walk into a bar and the Hungarians say “See ya” they are saying hello, not get outta here.